• Full Name: Select which element to connect to the module from the drop-down list of elements that already exist in your scene. • Drawing Path: Displays the full path to the current drawing. • Use Embedded Pivots: By default, this option is set to Apply Embedded Pivot on Drawing Layer. • Don’t Use Embedded Pivot: When this option is selected, the layer will not use the pivot set on the drawing or symbol. The pivot will be located at the centre of the Camera view, meaning (0,0,0). If there is a transformation applied on the layer, the pivot will be offset following the transformation. • Apply Embedded Pivot on Parent Peg: When this option is selected, the pivot set on the drawing or symbol will automatically be applied to the first peg layer the drawing layer is connected to. When selecting the element in the Camera view using the Transform tool, the peg layer will be selected. Even when the drawing layer is selected in the Camera view, the transformation will be applied on the parent peg. You only need to use this option when you want to have the position of the pivot animate. This is useful if you want to have multiple views all on the same layers in the Timeline view. For simplicity and organization, it is recommended to keep all views on their own separate layers in the Timeline view. Then you can simply set the pivot using the Rotate tool for the whole layer. 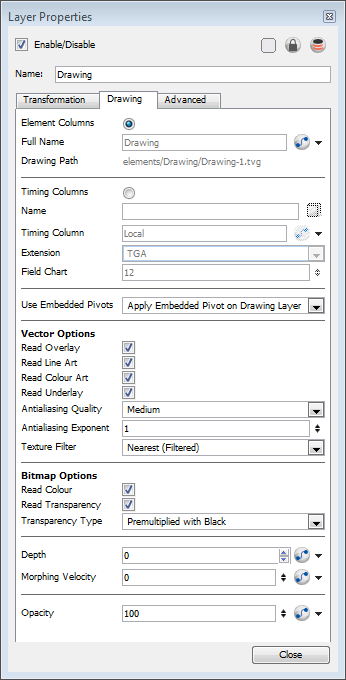 • Apply Embedded Pivot on Drawing Layer: This is the most common behaviour a user will use. Automatically, the layer will use the pivot that was set on the drawing or symbol’s frame using the Pivot tool. Refer to the Setting the Pivots to learn about using embedded pivots. • Read Overlay: Enable this option to display and render the Overlay layer of this drawing layer in your scene and final export. Disabling it will hide it. • Read Line Art: Enable this option to display and render the Line Art layer of this drawing layer in your scene and final export. Disabling it will hide it. • Read Colour Art: Enable this option to display and render the Colour Art layer of this drawing layer in your scene and final export. Disabling it will hide it. • Read Underlay: Enable this option to display and render the Underlay layer of this drawing layer in your scene and final export. Disabling it will hide it. • Antialiasing Quality: A smoothness setting applied to Colour Art. Higher quality images require more time to render and more system memory. Choose a lower quality if you are rendering a pencil test. • Antialiasing Exponent: Controls the size of the area around the Line Art and Colour Art edges that is used in the antialiasing process. A higher value uses less area, resulting in sharper edges, while a lower value uses more area, resulting in softer edges. If the Antialiasing Quality value is set to Low (no antialiasing) or Medium Low, this value is ignored. The accepted values are between 0 and 1. • Texture Filter: This option changes the way coloured pixels of TVG textures are calculated when rendered for different degrees of accuracy. • Read Colour: Controls the production of colour information from bitmap images. If this module reads 3 or 4-channel bitmaps, this selection determines whether the colour should be read or ignored. If this module reads 1-channel bitmaps, this selection determines whether the channel should be read as colour. When this option is selected with 1-channel images, the resulting image will be a greyscale image. • Read Transparency: Controls the production of alpha information from bitmap images. If this module reads a 1 or 3-channel image, this option will create a matte from the colour values in the image. If the module reads a 4-channel image and this option is not selected, the alpha information in the image will be ignored. • Clamp Colour to Alpha: Select this option when you want to pre-multiply the colour value with the alpha value. When the colour is clamped to the alpha, the colour value cannot be higher than the alpha value. It calculates the real colour value faster. When the RGB values are multiplied with the alpha value, that is to say, if you have a pixel of value R=247, G=188, B=29 and the alpha is 50% or the image has a 50% transparency, then the actual RGB values output would be half of the amounts listed above. • Depth: Overrides the order of cables in the network to determine how this element is rendered. • Morphing Velocity: Attaches a function curve to interpolate the morphing velocity between two frames. The morphing velocity at a specific frame is the ratio of the difference between the current frame and the first and last frames of the morphing. • Opacity: Use this slider to quickly change the opacity of the selected element. Opacity settings here will be reflected in both OpenGL preview, and full render. To learn about the Morphing Velocity option, refer to Adjusting the Velocity and Timing.